Hall of Mirrors; a mystical name for one half a century’s old coffee shop located in the heart of Ipoh’s old town that has stood the test of time; serving generations of Ipohans and still drawing the crowd; young and old, near and far. The actual name for this outlet is Thean Chun coffee shop, while some might relate to this as THE coffee shop beside Kong Heng. The “mirror” portion refers to the abundance of large, rectangular-shaped mirrors hanging from the upper part of the walls whereby you can practically observe every single patron in the shop if you’re seated at the right angle. Let me take you for a ride down memory lane once again, following up on the 4 years-old post on Thean Chun I did way back then when I first started writing …. Same old Uncle selling the Chee Cheong Fun that I have literally grown up with; eating from his stall at St. Michael’s Institution’s canteen! The good thing about going back to Ipoh for short weekend getaways (or the occasional weekdays, now that my schedule’s all messed up) is that I could never fail to come up with places to eat that will somehow bring a spark to one’s eyes. Either you’re a homegrown Ipoh child whom have not been back for years, or living miles away from Malaysia and the cravings for Ipoh street food grew to a state that’s so strong, you feel like bursting into tears at the sheer mention of Ipoh’s kai see hor fun, popiah or even the legendary (in a lot of ways); pork satay from Kong Heng. The tourists or first-timers are the other group of folks that I would love to introduce to my favourite stall in all of Ipoh for Chicken Kuey Teow Soup (the ‘kuey teow’ in this context being Ipoh’s ‘hor fun’ or flat rice noodles with a silky smooth finish that will put most imitators to shame), coupled with a caramel egg custard that are still crowned as the BEST in Ipoh so far. Flawlessly creamy, egg-y and smooth, the wobbly custards deserve an honourable mention had they not been overshadowed (somewhat) by the crazy plethora of must-tries in Thean Chun and Kong Heng. 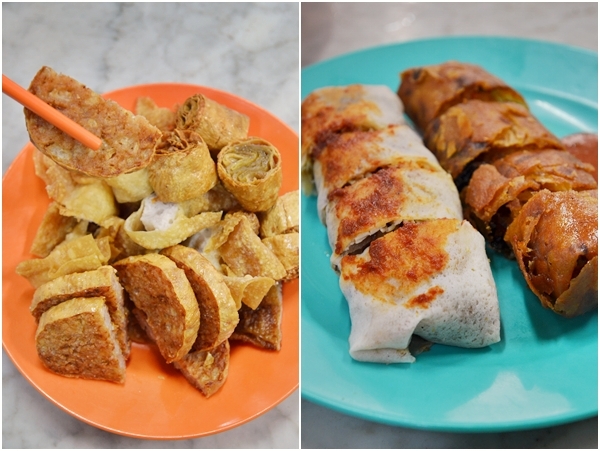 For one, I don’t deny that I still love Kong Heng’s popiah (both the wet and fried versions) compared to the others. And yes, I have visited the old uncle in Canning Garden, the Bercham popiah stall by the field, and even the renowned Taiping Popiah. Actually, Kong Heng’s popiah stall’s original proprietress has thrown in the towel a good few years ago, though the recipes were replicated at such an incredibly similar manner, it’s hard to tell the difference had you not been eating the popiah on a constant basis since you were small. 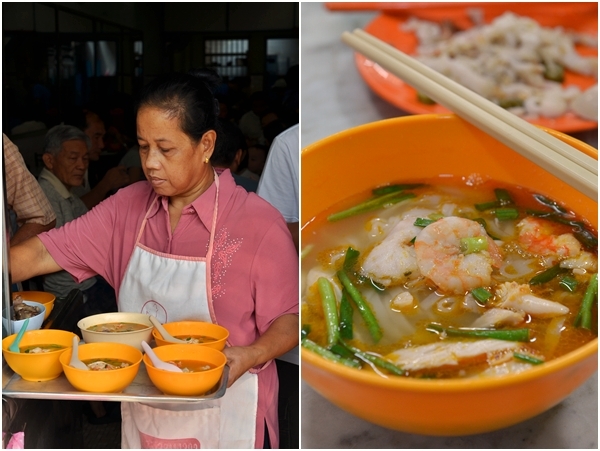 And who can deny the lure of a classic Ipoh-style of Chee Cheong Fun stall parked on the side of Thean Chun, almost sharing the alley with the satay stall, and Kong Heng within a stone’s throw away. Try the simplest ensemble; comprising of soy sauce, shallot oil and a dash of sesame seeds for the best result. You can order anything from either shops EXCEPT for the “Kai See Hor Fun” since both premises have one each. And of course, you cannot enjoy the caramel egg custard if you’re seated in Kong Heng since the desserts are from the beverage counter. 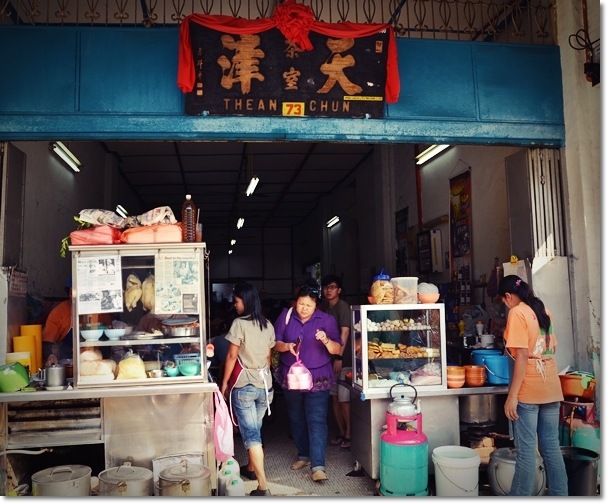 Those could be reasons why Thean Chun usually will be crowded almost immediately after they open for business (around 9.30am), until lunch hour. You can opt to have a plate of Lor Bak (a Penang classic that I can’t find a stall in Ipoh that can rival Kheng Pin’s on Penang Road yet) if you’re seated on either one of the shops too. As for the fried Yong Tau Foo (we call them “Liew”) stall in Thean Chun, I won’t go all out and recommend you to try them though. Ya..ya…still can remember the popiah aunty vividly.the popiah had the crispy fried prawn n crab meat in it. i mean real crab meat…….savory taste which i cannot find in spore. 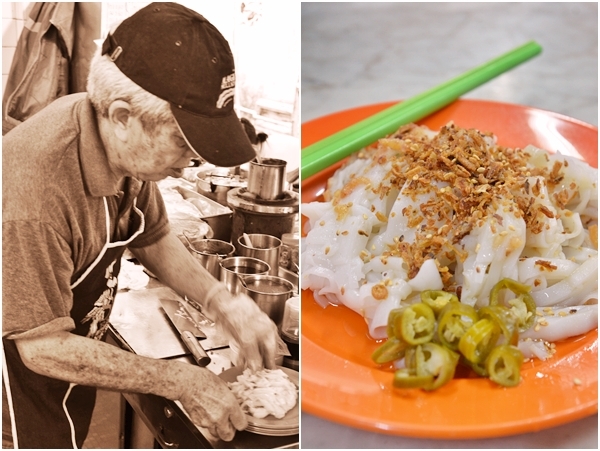 Nowadays you can only find crab meat in popiah from the uncle in Canning Garden back alley. Though did not see him for a few occasions now. I just went back last weekend and I had all the foods that you had mentioned..
but the sad thing is the popiah and their standard had dropped…. I missed the old uncle popiah ..
thought the original popiah propietor was a lady (really loud lady)? Yup, very nice lady. An aunt of a friend of mine. In SMI, the stall was operated by someone else apparently. The guy in the pic is the owner of this stall for years. 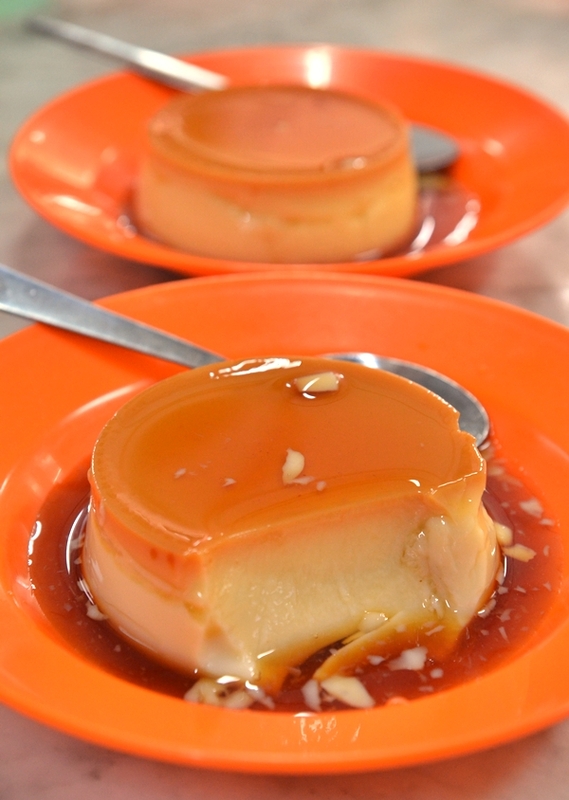 going to Ipoh this coming Sep, the egg custard is something I must have! Hey, let me know if you want to visit Sekeping Kong Heng…..can help arrange. Hi Patrick, yeah. I wanted to walk in for a visit but was informed that I needed to make a prior appt or call the operators first. Ok. Email me when you want to go and I will arrange it. Photos during the day and night come out quite differently. Patrick, I can’t help but wonder. Are you related to the establishment somehow? I am heading to Ipoh this coming Friday. Am really intrigue my Sekeping Kong Heng and want to have a look at the establishment as well. The place looks so awesome! My good hometown, Ipoh, longing to go back for a visit especially Kong Heng & Thean Chun which were my favorite breakfast joints during my teenage years. Salivating and drooling when I see the pictures of CCF, popiah and kai see hor fun!!! Suggest some of these food caterers should come to open shop here in Sabah. Guarantee making good business and money. Yeah! Ditto they should get more food from East Malaysia over to this side. As I believe there are good stuff that will definitely take off here. Thean Chun’s egg custard really not that good anymore. Operator changed, taste changed. Found to have some bitter taste. But then they still the best. As for the Chicken Shredded Hor Fun, the owner’s son operate a store in Puchong Jaya. Goodwill restaurant. Claim that the oil, noddle and bean sprout are all from Ipoh. Not bad..worth a try. Thanks on the Puchong Jaya branch. Agreed that there were times when the egg custard had a burnt, and even cloying egg taste (‘sou’?) but this breakfast experience proved otherwise. Still very good. Kong Heng popiah was good but the man who sold the best popiah used to operate from Kong Meng.They were brothers.Thean Chun hor fun is still the best especially their famous shallots n prawns roe oil.How I miss the food from those two shops after all these years living abroad. Hi Stanley, where is this Kong Meng? my friends and i were sitting in Kok Heng last 917, and she bought 3 bowls of caramel egg custard for us to try, even carried it with the kopitiam’s tray (we returned the tray after makan), hehehe. the caramel egg custard is real good! Haha … self-service caramel egg custard?! Cool. Now that you mention it, yup, Thean Chun’s version is still unrivalled in my opinion! I grew up going to Thean Jin 40 years ago. At that time there was only one stall that is the Kai Si Hor Fun. The cashier counter is still the same one. We were family friends. After the founder past away , I lost touch with his family. Wondering if anyone here knows the family of the founder? I would like to get back in touch. 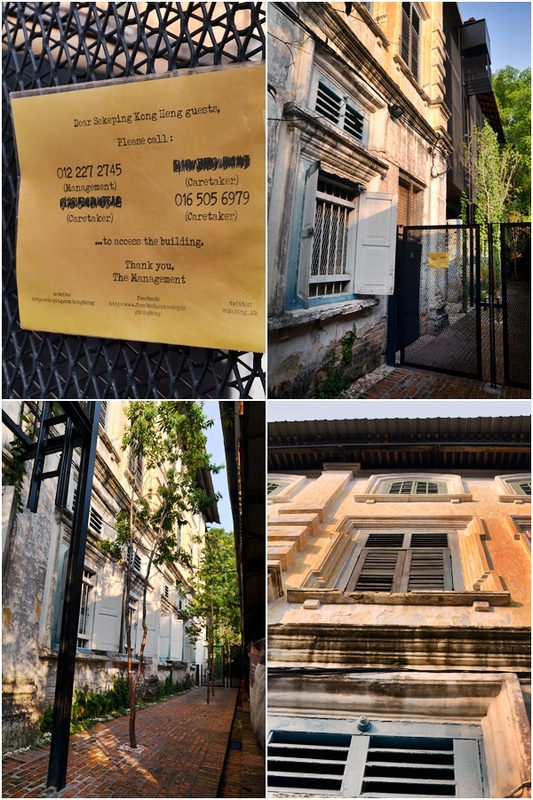 For the history, my 81 years old mum just shared that Thean Chun’s hall of mirrors were retained from a famous barber’s shop business(Owner Wong Woon) after the shop takeover.